Anne-Marie Faiola is one of my favorite soapmakers, and I just loved her book Soap Crafting. I think Anne-Marie does a great job creating easy recipes and experiments that beginners can try and also inventing advanced recipes and techniques for more experienced soapmakers. 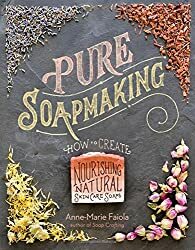 In her latest book, Pure Soapmaking: How to Create Nourishing, Natural Skin Care Soaps, Anne-Marie shares her techniques for natural (or nearly natural) soaps using essential oils and natural pigments. Once again, Anne-Marie’s book is not only chock full of recipes but also great advice and excellent photography. Anne-Marie describes how to make herbal infusions and what hues you can expect from a long list of natural colorants (including pictures). Also included is helpful information about essential oils and using liquids besides water. In all, it has a great deal to offer both beginners and experts alike. Kudos to Anne-Marie also for explaining the clean-up process, which many books leave out. 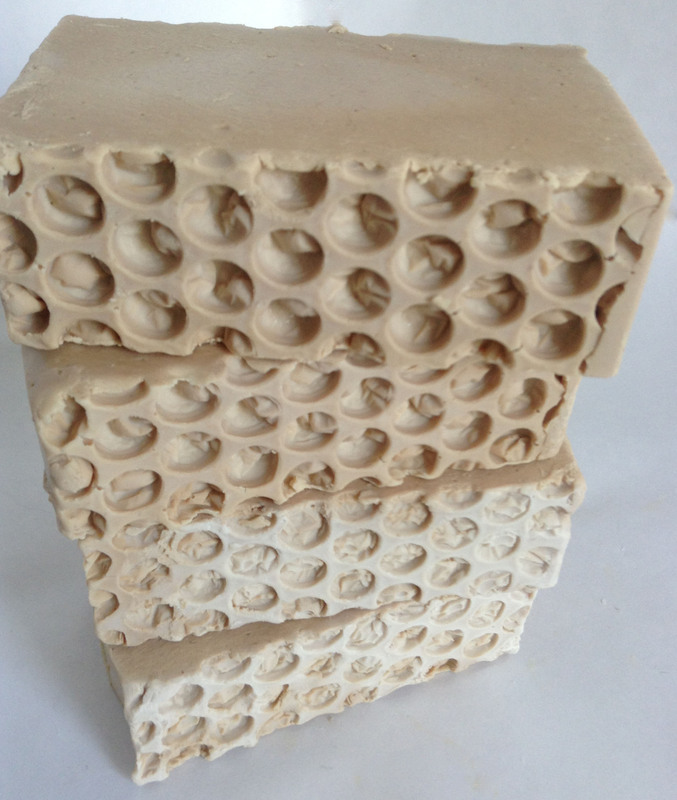 I also like that Anne-Marie describes how to create a soap tent for insulating soap so it goes through gel phase. I myself save soft drink fridge pack boxes, which are just the right size for sliding a soap mold into, and then I cover the boxes with a towel. I do have a question for Anne-Marie, and as she sometimes reads and comments on this blog, I’m hoping she will chime in. She mentions on p. 39 that “‘light’ olive oil… doesn’t often work in soap at all.” I was curious about this comment because I usually purchase what might be called pure olive oil rather than extra virgin or virgin, and it is golden yellow in color. Is that not the same thing as light olive oil? If so, I use it in every batch of soap I make, and it works great. If it’s different, I’m curious as to what, exactly, light olive oil is. I was drawn to Anne-Marie’s Gardener Scrub Soap made with coffee grounds, which appears on pp. 122-125. I played a bit with recipe and omitted the canola oil and used a recipe with olive oil, coconut oil, palm oil, avocado butter, and castor oil. I increased the amount of coconut oil to add more cleansing properties to my soap as well. Please note: if you tweak soap recipes from a book or website, always remember to run your new recipe through a lye calculator. I didn’t have any basil essential oil, so I made a blend of rosemary, lemongrass, and peppermint essential oils. I also didn’t have some of the colorants Anne-Marie used and substituted instead puréed carrots, yellow Brazilian clay, and chromium oxide. I had been dying to try out the multi-pour tool I recently purchased, and the Gardener’s Scrub Soap was perfect for the experiment. 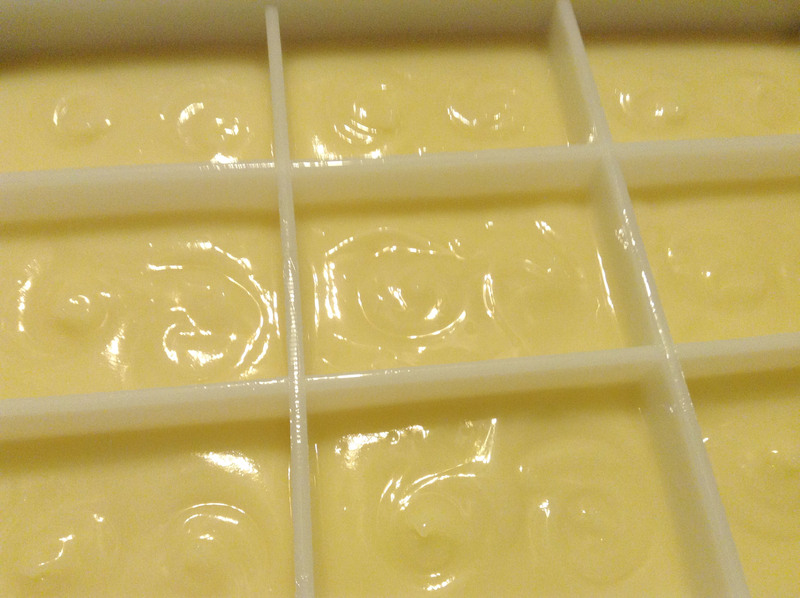 Anne-Marie suggests using sodium lactate to harden soaps made in silicone molds, so I took that advice as well. For the curious, the soap with the carrots is the lighter yellow while the soap with the yellow Brazilian clay is the more orange shade. There is no colorant in the soap with coffee grounds, and the green portion is colored with chromium oxide, so all of the colorants are natural or “nature identical.” I did gel this soap to make the colors pop, and I had to place it on a heating pad to force gel. Often, simply covering it is enough. It also had a fair amount of ash on the tops because 1) I don’t have any isopropyl rubbing alcohol right now, and spraying the tops reduces ash, and 2) I have found that soaps made with essential oils are more prone to ash anyway. I steamed it right off, though, as you can see. One of the reasons I started making soap in the first place was that I was drawn to natural soap sold at the farmer’s market I visited on the weekends when I lived in Georgia. My first soaps were all natural soaps made with no fragrance or with essential oils. As I began to experiment, I enjoyed using synthetic fragrances and colorants as well, but I find I am often drawn back to natural soaps again. Customers seem to be drawn to them as well. 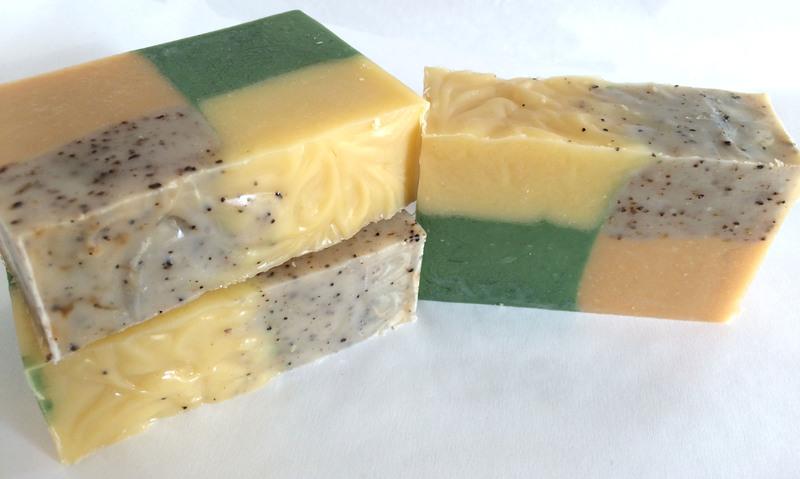 I enjoyed experimenting with one of the recipes in the book, and I was pleased with how the soaps turned out. Caveat: the term “natural” is not regulated by the FDA, and Anne-Marie’s book does have some recipes that include items such as chromium oxide, which are “[t]echnically manmade” but which “have the same chemical composition as mined ones” and are therefore considered “natural” or “nature identical” (46-47). Depending on your point of view, these pigments might not be natural enough. I would recommend this book to soapmakers at all levels of experience and particularly to those looking for inventive ways to make more natural soaps. I’m excited to try some of the other ideas in Anne-Marie’s book. I use kaolin clay in most of my soaps. 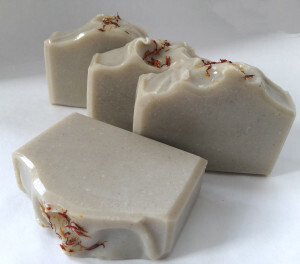 Kaolin clay is a natural and gentle clay that is kind to sensitive skin but also adds slip and silkiness to soap and helps the soap’s fragrance “stick.” Some fragrances, especially citruses, don’t fare well in the harsh environment of the chemical process involved in soapmaking. Kaolin clay gives the fragrance something to “cling” to and helps the soap better retain the scent. Kaolin clay is such a fine powder that it adds the mildest exfoliation to the soap, and it’s one of the clays that works well with all skin types. 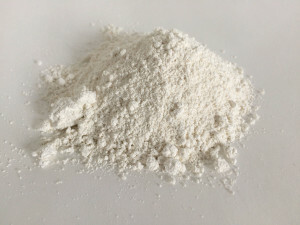 Dry kaolin feels like a smooth, fine powder and is often used in cosmetics and face masks. Kaolin cleanses and detoxifies, so it really does add a little something special to soap. I use a bit more than a teaspoon of kaolin per pound of oils in most of my recipes that don’t include other clays. For instance, in my Marseilles-style soap, which I call Provence, I use French green clay, and adding kaolin in addition would make the soap crumbly and chalky. Because the kaolin clay in my soaps is used throughout the bar and not as a colorant for a swirl, I simply add it directly to my oils before I add my lye water, and I stick blend it well to make sure the clay is dispersed and no clumps remain; however, I should add that I have not noticed that kaolin clumps a lot, unlike some other clays. You can use up to a tablespoon of clay per pound of oils, but my own experiments with clay in those amounts produced a chalky soap. Your own experiments may yield different results. My own experience is that soap with clays, including kaolin clay, feels smoother and silkier without any detrimental effects on the amount of lather. Bonus: a picture I took just today of my Johnny Appleseed Soap, which like my other soaps, has a little over a teaspoon of kaolin per pound of oils. 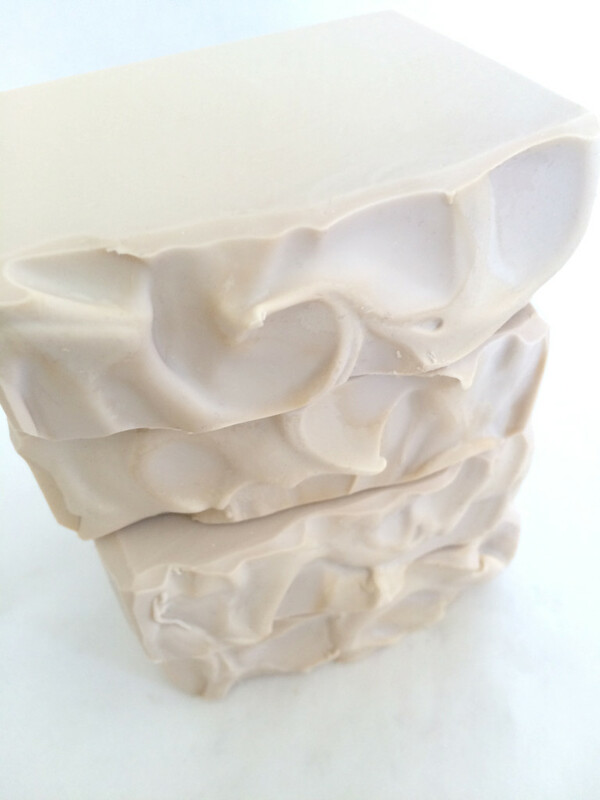 Maya of Infusions and Silvia of Soap Jam have also blogged about using kaolin in their soaps. Do you ever read over recipes or watch soaping videos and wonder why soapmakers use the ingredients they use? After all, the only essentials for a good bar of handmade soap are oils, water, and lye. However, certain additives do impart some nice qualities to your soap, and in a series of posts, I wanted to share some of the “extra” ingredients I use in soap and why I use them. Heavy cream has a lot of fat in it—36% fat or more. Goat milk typically has 4-5% fat. Cream is very rich and smooth. While the benefits of milks—especially goat milk—are widely known, not as many soapers use cream, possibly because of the expense. I wouldn’t try substituting all of the water in a recipe with cream, and not only because of the cost, but also because of the high fat content. The cream will likely congeal fairly quickly, even if you freeze it first, because the lye will react to the fat in the cream. If you have made milk soaps, you may have noticed that if you set the milk and lye mixture aside for a few moments, it does start to thicken as the lye reacts to the fats in the milk. Another reason you might not want to use cream as a total water replacement is that the high fat content might really throw off your superfat percentage. So how do I use cream in soap? I usually add about 4-5% of the amount of oils to a batch of soap. So, for example, if I make a batch of soap that is 500 grams (I always measure in grams; it’s more precise than ounces and easier to convert), then I would add about 22 grams of cream to the batch. I admit this is approximate because I usually add a round number of grams of cream to my soap. For example, my typical batch is about 2.5 pounds of oils, or 1120 grams, and I usually add about 50 grams of cream to a batch that size. I would recommend using heavy cream at a rate of about 3-5%. You really don’t need to use a lot. When I use cream in my soap, I remove the same amount of water from the recipe. For example, in my batch with 50 grams of cream, I remove 50 grams of distilled water from the recipe. If you use full water and cream, you might find your soap takes a little longer to harden. I have not experimented with using full water and cream. Before I add the cream to the oils, I warm it up a bit so that it is the same temperature as the oils (more or less). Then, I add my cream directly to my oils and stick blend it before adding the lye. I have noticed that it will not emulsify completely with the oils. Typically there are tiny white flecks of cream floating on the top of my oils. I usually give the oils one more quick stick blend before adding the lye water, but it probably isn’t necessary because once the lye water is added, it will all blend. I first noticed the benefits of using cream in soap by accident. I made a batch of Creamy Coconut soap with coconut milk and cream. I mainly added the cream because I felt it would be in keeping with the name of the soap to have both real coconut milk and real cream in it. When I used it in the shower, I noticed how smooth the bars felt. If you can believe it, I didn’t immediately realize this smoothness was because of the cream. I thought it might have been the coconut milk. I started noticing that other soapmakers used cream in their soaps, and when I ordered soaps from these soapmakers, I noticed how smooth their bars were. At first, I wasn’t sure why their soaps were so much smoother than mine either because there are so many variables—oil recipes, other additives, and the like. But eventually I realized it was the cream in the soap that added smoothness. I have used cream in almost all of the soaps I have made since that discovery (I typically do not use it in milk soaps, with the exception of Creamy Coconut). In addition to smoothness, cream adds some of the same benefits as other milks in soap—extra conditioning being the main benefit imparted by heavy cream. I mainly enjoy the feel of soap with cream in it. It is definitely smoother than soap made just with water. It feels silky on the skin. I typically do not have to use much lotion at all because of the conditioning oils and butters in my soap, but I have noticed even less of a need to use lotion in those soaps made with cream. 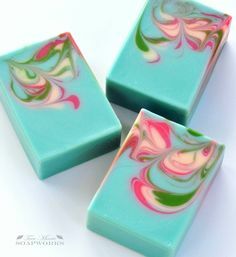 Adding just a little bit of cream can add some great qualities to your soap. With my recipe of just 50 grams, I am adding 18 grams of fat, so my superfat percentage will not be drastically different from my calculation. As usual, David Fisher has experimented with cream and shared his results. You can see what will happen if you add lye to cream in his tutorial. I personally have not found it necessary to freeze the cream I use in my own recipes. In addition, I have never noticed any discoloration as can happen when you use goat milk in place of water. I actually haven’t tried using just a small amount of liquid goat milk and adding it directly to the oils as I do with heavy cream, so you might find that solution works just as well for you. 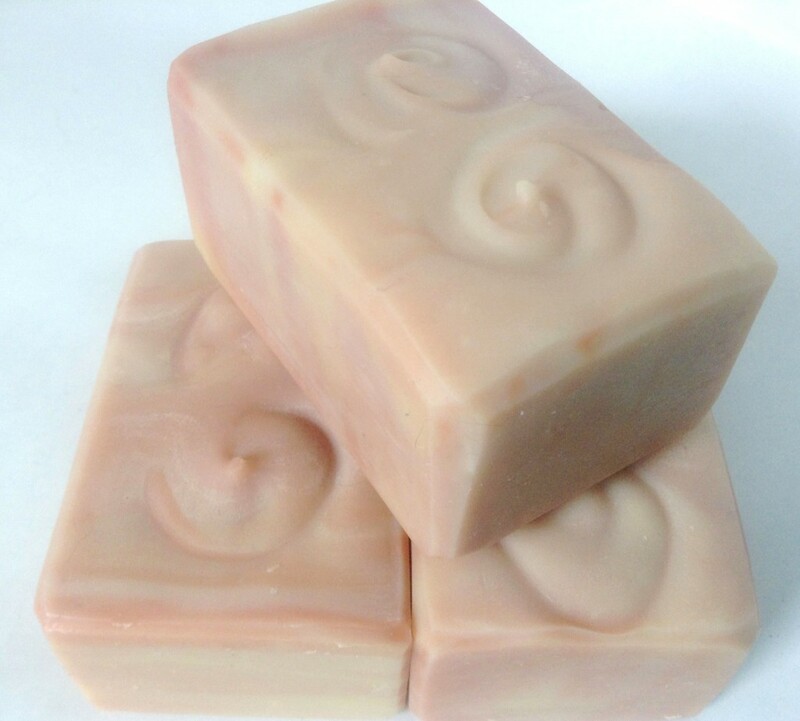 Make your own version of my creamy soap. Dissolve the lye in the distilled water and set aside to cool. Melt coconut oil and palm oil. Add olive oil and castor oil to melted hard oils. Add heavy cream to oils and blend. Combine lye water with blended oils when both reach about 100ºF. The temperature doesn't need to be exact, but it should be close. Blend with stick blender until you reach trace. Add fragrance or essential oil and stir well until thoroughly combined. Pour into a mold, cover mold with plastic wrap, and drape with towel. One pound of oils will make approximately 1.4 pounds of soap. Let soap go through gel phase and saponify for about one day before unmolding. Note: you can substitute coconut milk, like I did, for the water simply by using 151 grams of frozen coconut milk and slowly adding the lye to the milk until the lye is dissolved. You can also use colorants. I have not had issues with this soap overheating or acting strangely in gel phase, but keep and eye on it, and remove some insulation if it appears to be getting too hot. Also, you can opt not to gel this soap and instead put it in the freezer overnight. The cream might make the soap heat up in the refrigerator, so it might need the additional chill of the freezer to prevent gel phase if you choose not to gel. If you’ve been following some of the news surrounding the Personal Care Products Safety Act of 2015, a bill introduced by Senators Dianne Feinstein (D-CA) and Susan Collins (R-ME), you may have read some alarming and even irresponsible reporting that led you to believe that the U. S. Government is about to shut down all handmade soapers for good. This simply isn’t the case, and you have no cause to be worried about New England Handmade Artisan Soaps or most of your other favorite handmade soapers. In fact, this bill is not likely to impact my business in its current form. Kenna of Modern Soapmaking has done a tremendous job breaking down the bill and explaining the parts that are of most concern to soapmakers. Her work is so thorough that I will not reproduce it here, but I do feel compelled to address the most common concerns I have seen raised in articles about the bill. Congress is cracking down on homemade soap. No, Congress is not targeting handmade soap. This bill is an amendment to the Federal Food, Drug, and Cosmetic Safety Act designed to “ensure the safety of cosmetics.” Handmade cosmetics are not being targeted any more than any other company that manufactures cosmetics is being targeted. The argument is that smaller businesses cannot afford the fees associated with registering products, but businesses that make less than $100,000 per year are exempt entirely from the requirement, businesses that make between $100,00 and $500,000 a year are exempt from the fee, and businesses that make between $500,000 and $2,500,000 would pay not more than $250 annually. Fees are graduated from there. I believe that very few homemade soapers would be impacted by this bill at all, and those soapmakers that are impacted are not going to be driven out of business by the regulations. This bill will make it impossible for small soap companies to remain in business. Actually, this bill just requires that soaping businesses earning more than $100,000 per year register and provide lists of the ingredients they use as well as report known adverse events. Labeling requirements will be stricter, but I personally think they should be. Right now, I am not required to label the ingredients in my soap at all as long as I make no cosmetic claims about it. I think that’s wrong. 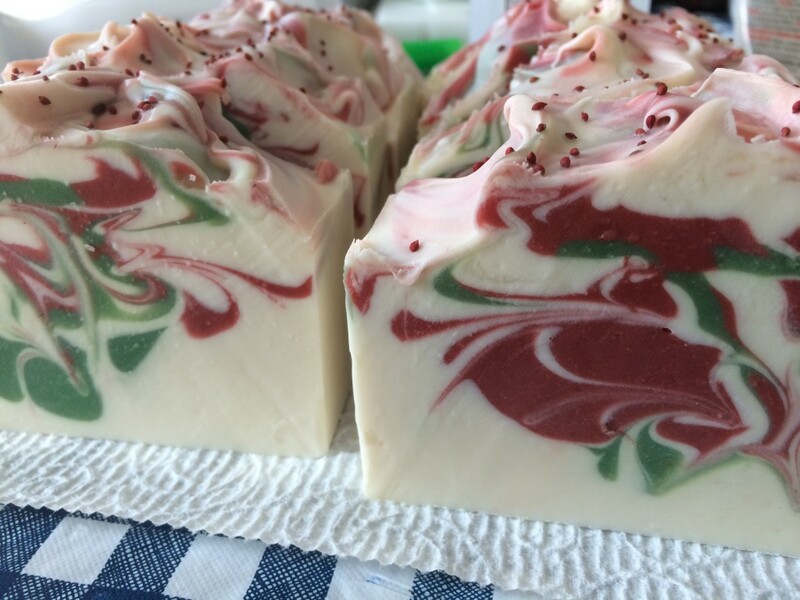 People buy handmade soap precisely because they want to know what’s in their soap. I should add that my friends in Europe who make soap currently DO have to comply with the same types of regulations that this bill would introduce, and as far as I know, it has not adversely affected their businesses. Celine Blacow of iamhandmade.com is one example of a personal friend. I am sure there are many others. My advice to anyone who is worried is first of all, read the bill. Second, follow its progress in Congress. Supposedly, May 10 was supposed to be the day we learned whether or not the bill had made it out of the Committee on Health, Education, Labor, and Pensions, but I can’t tell that the committee has acted on this bill. If it passes the committee’s hearing, it will be voted upon by the Senate, then the House, and then signed into law by the President before it becomes law, so it has some distance to go. You can sign up to receive alerts on the bill on Congress.gov like I did. Finally, you can write to your Senators and Representatives and let them know you want to make sure that whatever version of the bill passes through their hands includes provisions that will not make the law too onerous for small businesses to comply with. Most of all, it is important to educate yourself about the bill’s details before worrying that it is the end of the handcrafted soap industry. I am quite concerned about the amount of misinformation being distributed mainly because it is scaring my customers and my soapmaking friends. Diazolidinyl urea, propyl paraben, and quaternium-15 are preservative agents (quaternium-15 is also a surfactant). Lead acetate and methylene glycol are used in hair products (dyes and straighteners). Asking for a review does not mean these ingredients are not safe. I was not really sure what some of of this stuff was, so I did a little Internet research. PEG-80 Sorbitan Laurate is a surfactant, emulsifier, and fragrance ingredient. Sodium Laureth Sulfate is a detergent and surfactant. PEG-150 Distearate is a surfactant, thickening agent, and emulsifier. I am not sure it can properly be called soap, which is fine, because the manufacturer doesn’t call it soap, either. But all I have to say is… wow. I used this on my children. The safety of the ingredients has been called into question by various watchdog groups, and I realize they sometimes have an agenda, but this list of ingredients actually scares me. I realize that sometimes soapmakers are unfairly critical of commercial soaps’ use of chemical names. Everything on earth is made of chemicals, and commercial soapmakers have different regulations by which they must abide. But there is little in this list I could recognize from my own soapmaking experience except water, sodium hydroxide, citric acid, and sodium chloride. I don’t want to turn this post into an analysis of how bad commercial soaps are for you (because I’ve written that post before), but I want to know what’s in that vegetable soap base, too. The other ingredients I get (and use). Limonene is a fragrance ingredient. This soap is probably gentle, but it does have fragrance and titanium dioxide, which I would leave out of a soap formulated especially for babies. Still, there is nothing terribly alarming in the list of ingredients, and if you’re going to use a commercial soap, this one is probably better for baby than the previous one. As you can see, the conditioning quality is near the upper suggested limit, while the cleansing quality is near the suggested lower limit. This recipe is actually a tried-and-true baby soap recipe you have probably seen on other soapmaking websites. But what about other skin types? How do you formulate a facial soap for mature or sensitive skin? Oily skin? You really need to research oils and their properties. For my Carrot Silk Facial Soap, I left out scent and formulated the recipe for sensitive skin: olive oil, water, sustainable palm oil, coconut oil, sodium hydroxide, palm kernel oil, pureed carrots, castor oil, sunflower oil, goat milk, kaolin clay, tussah silk. As you can see, the conditional quality and cleansing qualities are mid-range, which is perfect for most people who want a facial soap that will wash away the dirt and makeup without stripping the skin. The addition of carrots, goat milk, kaolin clay, and silk to the soap add qualities that SoapCalc cannot quantify. My Lavender Chamomile Facial soap has the following ingredients: water, chamomile-infused olive oil, rice bran oil, avocado oil, coconut oil, sodium hydroxide, apricot kernel oil, shea butter, castor oil, lavender essential oil, pink rose clay, buttermilk. I chose chamomile, olive oil, rice bran oil, avocado oil, apricot kernel oil, and shea butter specifically for their conditioning properties. A glance at SoapCalc’s assessment reveals many quality numbers off the scale: cleansing is lower than recommended, iodine is higher, and INS is lower. Still, this recipe makes a very nice soap. The low cleansing number makes it especially good for dry, sensitive, or mature skin, as does the high conditioning number. Though this soap has fragrance, it is a lavender essential oil, and this blog post by Robert Tisserand does a good job of describing some of lavender’s benefits, even including research citations. But what about oily skin? I admit I haven’t made this soap yet, but I did some research and formulated a recipe with the following ingredient list: coconut milk, coconut oil, neem oil, sunflower oil, sodium hydroxide, sustainable palm oil, rice bran oil, castor oil, bentonite clay, activated charcoal, tea tree essential oil, rosemary essential oil. The numbers all fall within the suggested range, but this soap is more cleansing than the other facial soaps, and the iodine is higher than suggested. It should clean the skin without overdrying, which many commercial acne preparations do (which causes the skin to compensate by producing more oil, which continues a vicious cycle). If a cosmetic claim is made on the label of a “true” soap or cleanser, such as moisturizing or deodorizing, the product must meet all FDA requirements for a cosmetic, and the label must list all ingredients. If a drug claim is made on a cleanser or soap, such as antibacterial, antiperspirant, or anti acne, the product is a drug, and the label must list all active ingredients, as is required for all drug products. Where you might run into trouble is labeling a soap as anti-acne, which means you must comply with FDA labeling requirements for drugs. See this article for information about such labels. My understanding, based on reading this article, is that if you comply with these very specific requirements for labeling, you can make claims, such as anti-acne, about your soap. I do not plan to make any such claims when I make my soap. But based on what I’ve read, I believe I’m in the clear to say it’s formulated for oily skin types. If you’re looking to formulate your own recipes for various skin types, take a look at resources for oil properties. Two of my favorites are Summer Bee Meadow’s Properties of Soapmaking Oils and About.com’s Candle and Soap Soap Making site’s Qualities of Soap Making Oils article. Research various clays, essential oils, and other additives, such as botanicals, so that you can learn about their benefits for the skin. Do they work better on dry skin, or oily skin? What qualities do they have? I have put a great deal of research into each of the ingredients I’ve included in these facial soaps, and based on the testing for Carrot Silk Facial Soap and Lavender Chamomile Facial Soap, it appears as though the research has resulted in soap that really does what I hoped they would do. Milk soaps are so much fun to make, and there are so many choices. How do you know which kind of milk to use or even how to use it? It depends on what qualities you’re looking for in your soap. 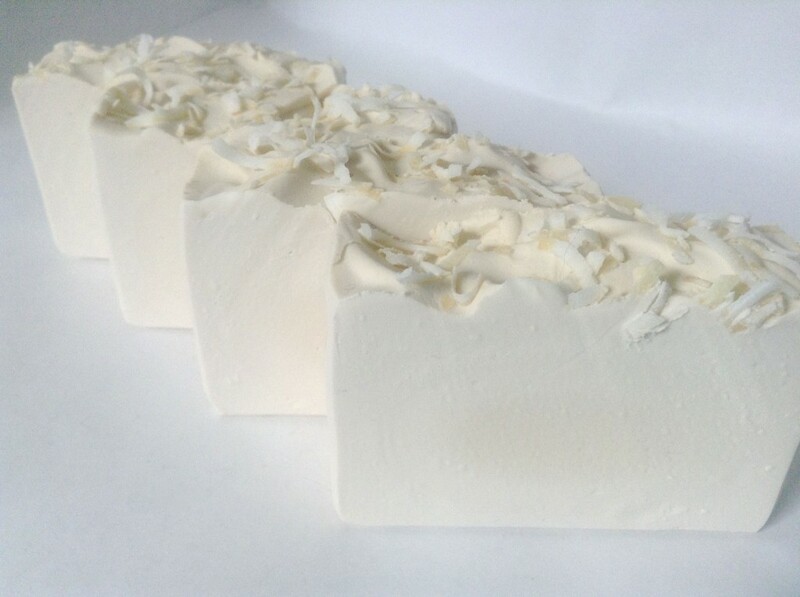 Coconut milk is possibly my favorite milk to use in soap, and it is also one of the easiest. Some of the qualities I have noticed are a tendency to increase fluffy lather with big bubbles and to lighten the color of the soap. Most milk soaps will be a bit darker than water-based soaps, but coconut milk soaps look lighter than water-based soaps to me. 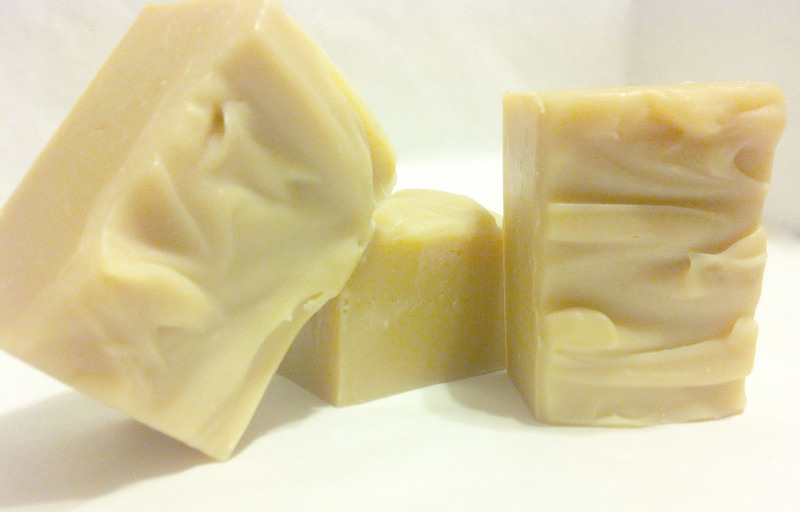 Coconut milk soaps feel creamier than water-based soaps as well. 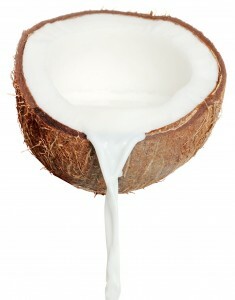 I use coconut milk just like I use other milks: I freeze the milk and add the lye a little bit at a time. The handiest method might be to measure it out in ice cube trays, freeze it, and then just use the amount you need. I think that coconut milk behaves a little better than other milks. It doesn’t tend to discolor, like goat milk will, and it is a lovely creamy white right up until you add it to the oils. I have noticed that like other milks, the lye will begin to saponify the fats in the coconut milk, so I tend to give it a stir every few minutes until I’m ready to add it to my oils just so that it stays smooth. However, I haven’t had any problems when I’ve added thicker, partly-saponified coconut milk to my oils. 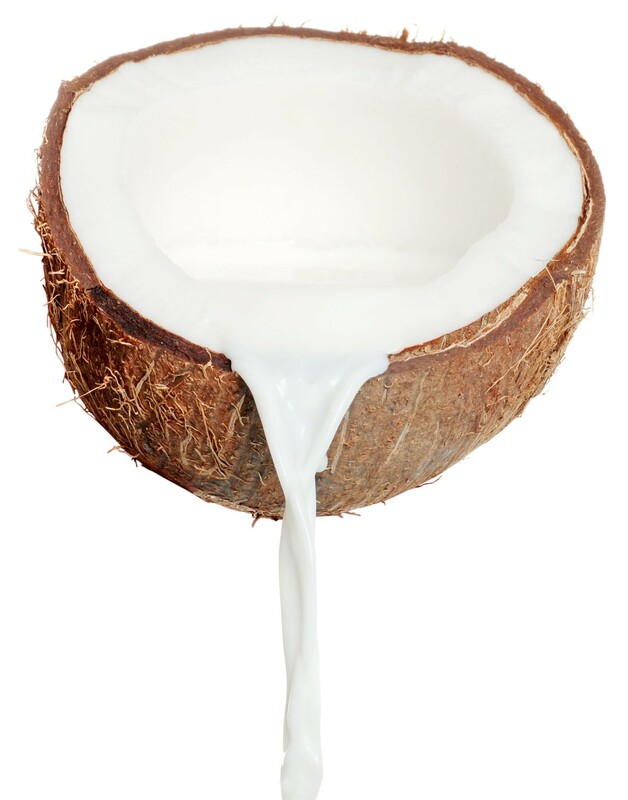 I use coconut milk in several of my soaps. I recently used it in a Creamy Coconut soap (along with real cream) that turned out very nice. Goat milk is the soap maker’s standby, and it’s fabulous in soap. It comes in three kinds: fresh, condensed, and powdered. I have used all three, and I prefer using it fresh or powdered. My experiments with condensed milk did not go as well. I think it discolors more than fresh goat milk, too. If you do use it, make sure you remember that you need to add equal parts water. Most soap makers who use it will reduce the amount of water for a recipe by half and mix that with their lye, making up the other half of their liquids with condensed goat milk. Fresh goat milk works best when it’s frozen, just as I described with coconut milk. 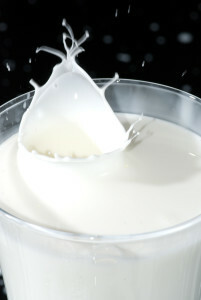 Add the lye to the frozen milk a little bit at a time, stirring well until the lye is dissolved each time. If you keep the temperatures low, making use of ice water baths when necessary, goat milk will discolor less, but it will still discolor. I happen to think naked goat milk is rather pretty. Goat milk produces a creamy, moisturizing bar of soap. It can be used raw or pasteurized. I haven’t noticed if it affects the lather much, but it does feel nice on your skin. I also used powdered goat milk in some of my soaps. I add the powdered milk directly to my oils and stick blend it in to combine it until it is well incorporated, and I can’t see any clumps. I have never had any problems using powdered milk in this way, though I have heard some soap makers actually mix up the goat milk powder with water and then freeze it, just as with fresh goat milk. Some soap makers also add the milk powder at trace. Powdered goat milk still adds creaminess to the soap, but it’s much easier to use than fresh goat milk. I have used cow milk in my Chocolate Milk bars. It works fine, and I liked it, but I do feel that goat milk adds a certain extra something that cow milk doesn’t. I recommend using whole milk when using cow milk. It should also be frozen and mixed slowly with the lye. I noticed that while goat milk tends to turn an orangey shade when it is getting too hot, cow milk turns more yellow. 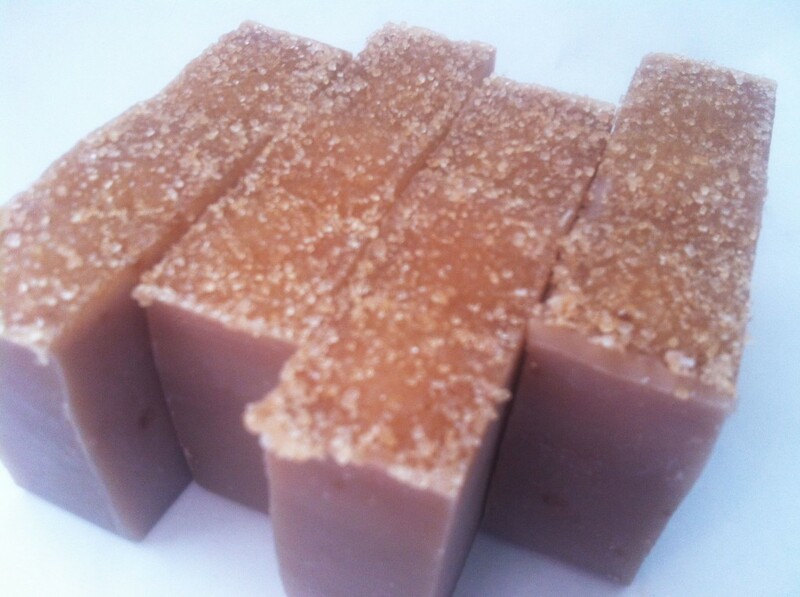 I recently made my own almond milk and used it in a new Sweet Almond and Honey soap, and I loved it. The soap has a fluffy, bubbly lather and smooth feel. There are too many variables to say for certain the almond milk made all the difference—I also used more sweet almond oil than I typically do, and the soap has honey it in, which likely contributed to the wonderful lather. I used almond milk in the same way as I did every other milk: I froze it and added the lye slowly to the frozen almond milk. I noticed this milk, like coconut milk, stayed whiter, but it did not saponify with the lye that I could tell, and it could be that it has less fat. It was nice to work with, and I’d do it again. Yogurt is wonderful in soap. I use full fat plain yogurt and mix it with an equal amount of water to thin it. Then I freeze it and use it like I would any other milk in soap. It truly adds a luxurious feel to the soap. It feels smooth and creamy. I think some soap makers add yogurt to their oils either before adding the lye or at trace, but I haven’t tried that yet, though I have used yogurt powder in my oils, and it’s very nice—similar to goat milk powder. I like using buttermilk powder in soap more than fresh buttermilk, but that’s just because it’s a little easier. Buttermilk has alpha hydroxy acids that are very good for facial soaps. I use it in my Lavender Chamomile facial soap. This is a very nice facial soap for a lot of reasons, including the oil combination, the chamomile-infused olive oil, and the French pink clay and lavender essential oil, but the buttermilk contributes very nice qualities to it. Cream is amazing in soap. I have not tried substituting all my water for cream, but I have tried adding cream to my oils before adding the lye, and it results in a very nice, luxurious feel. 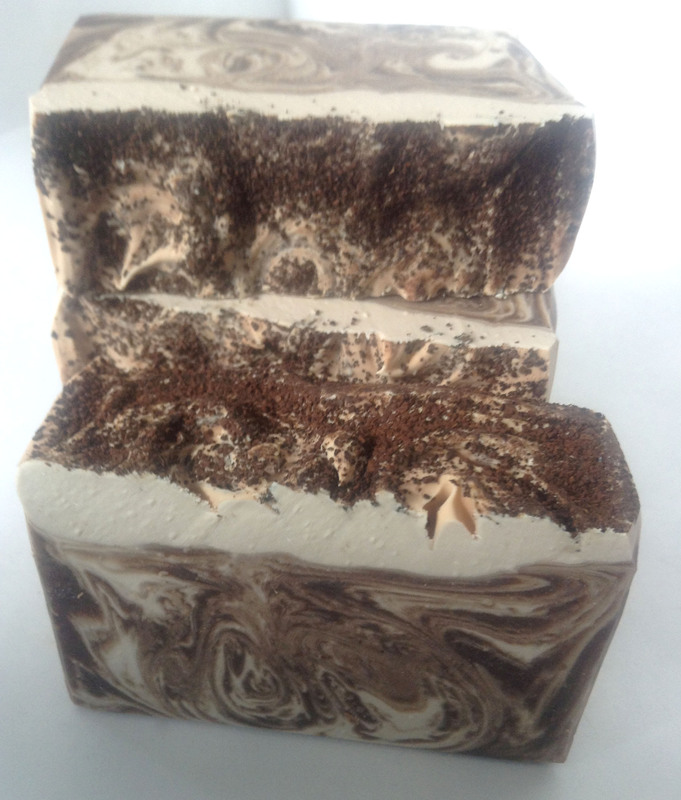 In my Coffee and Cream soap, I mixed cream with the white part you see marbled through the soap, in addition to the coffee you see in the brown part. It was a little bit of juggling, but the bar is so amazing! It smells and feels incredible. If you want to learn more about making soap with a variety of milks, I highly recommend Anne L. Watson’s book Milk Soapmaking. There seems to be some debate in soap making as to whether or not the “numbers” matter. When I use the term “numbers,” I speak of the range of suggested values as you see in the image above: bar hardness, cleansing ability, conditioning quality, bubbly lather, creamy lather, iodine number, and INS number. A hard bar of soap is generally preferred because it will last longer. All soap is cleansing, but some feel that soaps with a higher cleansing value can be more drying, while others may want a more cleansing soap for certain purposes. Soapers generally want their soaps to be conditioning, which makes them gentle. Bubbly and/or creamy lather is desired because it makes it easier to create lather. The iodine number can give soapers an indication of the bar hardness (lower number) and softness (higher number) as well as the bar’s conditioning quality (higher number). The INS number is believed to predict at a glance many of the other bar properties of hardness, cleansing, conditioning, and lather. The ideal INS number is supposedly 160. But do these numbers really matter? There is some debate among soap makers as to their value. Two different perspectives from two respected soapers, for example, are Anne-Marie Faiola and Jasche Homemade Soap (dead link removed). Neither recommends that you either adhere completely to the INS calculation or deviate entirely from it in formulating your recipes. In fact, both posts I linked advocate a common-sense, test-it-yourself and see-what-works-for-you approach to using the INS numbers. On the other hand, I have found looking at the numbers to be helpful in creating my own recipes. most of which have an INS in the range of 140-160. My own experience has been that soaping in the 140-155 has been my personal sweet spot in terms of all the qualities I want in soap. I think the INS number is an excellent guide for soapers creating their first recipes, but I also think it’s a good idea to experiment and research what oils actually do. Anne-Marie has just recently published a great guide to soaping oils. I plan to import the handy PDF she shared in that post into my Evernote soaping notebook. As you can see, the hardness number is on the very bottom of the suggested range. And yet, the bar feels quite hard, possibly due to the unique quality of the olive oil I used, which though it has a low hardness value, actually produces quite a hard soap if given a longer cure. The cleansing value of 10 is off the chart, which may be desirable in a soap for dry or mature skin. The conditioning value of 67 is near the top of the range, which is also good for dry/mature/sensitive skin. The bubbly and creamy values are within the suggested range. However, the iodine is much higher than suggested, and the INS number is much lower than suggested. If I had formulated this recipe early on in my soap making adventures, I might have discarded it as having an INS that was too low, but I know this is a good soap now that I can read the numbers more critically. Rather than paying attention primarily to the INS number, I tend to look at the ranges for hardness, cleansing, conditioning, bubbliness, and creaminess and experiment with oils in my recipe until these numbers fall in the ranges I am looking for—which may not always be, as you can see, the suggested ranges. So do the numbers matter? Frustratingly, the only answer I can provide is both yes and no. I think it depends on your level of experience in creating recipes and your goals for your resulting soap. 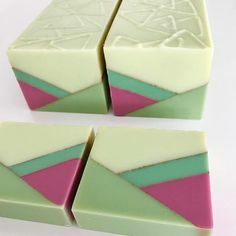 I think soap makers who completely ignore the numbers possibly do so to their detriment, but I think soap makers who adhere to the numbers slavishly may also be missing opportunities to create wonderful soap that doesn’t fall within the suggested ranges. If you are a soap maker, what are your thoughts about the numbers? Do you use them? How? Do you discard them completely? Why? I would love to hear your thoughts in the comments. Do you keep a soaping journal? If you don’t, you should. You can keep track of your recipes so if you really like one, you can replicate it. You can make note of any issues that arise with a recipe or additives, such as a fragrance that accelerates. You can keep track of supplies, cure dates, and soap stock. My day job is technology integration specialist at a private school, and I have found ways to use technology even in cold process soap making. I have been using software called Evernote to manage my soaping recipes for some time now. Here is a tutorial I made for using Evernote with SoapCalc to manage your recipes. I have found Evernote indispensable as a tool for soap making. If you check it out, please let me know what you think. I have spent quite a lot of time thinking about my soap recipes, formulating what I hope will be a good bar of soap with a smooth feel and great lather, but will also leave your skin feeling soft and clean without being tight and dry. In addition to considering the qualities of the fully cured bar, I also think about which oils will be good to work with in soaping. Which ones will speed up trace or slow it down? Which ones will produce a lighter bar? I made a decision very early on that I would not use animal fats in my soap making. Tallow and lard make nice, hard bars of soap, and you will find tallow in just about every kind of commercial soap you can buy because it is cheap and makes a great bar of soap. I just didn’t want to use it. I am not vegan or even vegetarian. I use other animal products such as milk, honey, and silk in my soap. Because I don’t use animal fats, I rely quite a bit on palm oil to add the same kinds of qualities, such as hardness and a stable and creamy lather. Palm oil is controversial because of the practices of some palm oil farmers, who cut down rainforests indiscriminately, threatening the habitat of the orangutan. However, it is possible to use sustainable palm oil. If a seller does not indicate that the palm oil I am purchasing is from a sustainable source, then I do not buy palm oil from that seller. For a while, I did buy palm oil that I did not know to be sustainable, but I felt wrong about it. I don’t feel wrong about buying sustainable palm oil. Some soap makers will say there is not really such a thing and are moving toward palm-free recipes, which is fine. I think purchasing sustainable palm oil is a good faith, moderate position to take. Think about it like this: What will the palm oil farmers do if the demand for their crop suddenly disappears? I am supporting those palm oil farmers who practice sensible and sustainable farming when I buy sustainable palm oil. I do have some palm-free recipes, and they are quite nice, too. Dr. Bronner’s website actually has an interesting article about its use of palm oil in bar soaps. 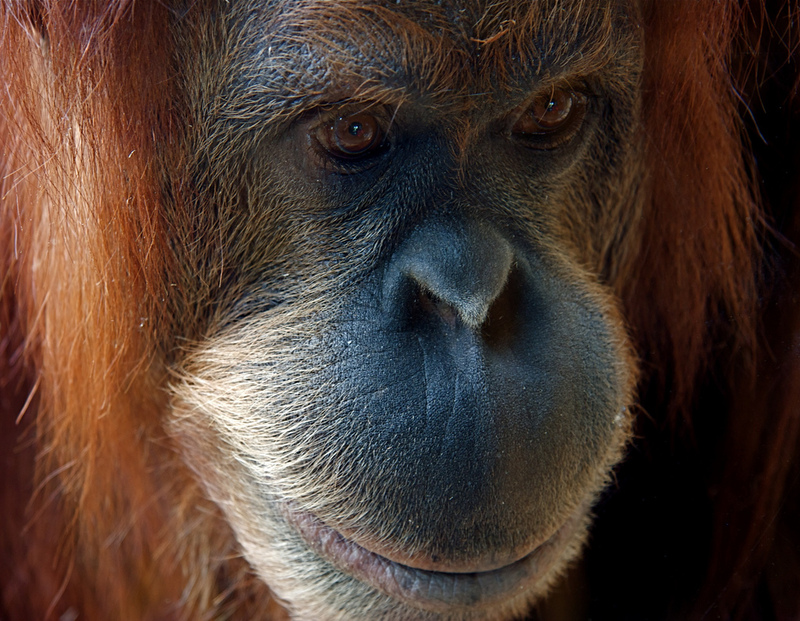 Anne-Marie Faiola (the Soap Queen) also has a post about palm oil at Bramble Berry. If you are a soap maker and are looking to purchase sustainable palm oil, Bramble Berry is one of two sources of which I’m aware, the other being Soaper’s Choice. I have to admit I have a personal preference for two types of soap: lavender-scented and food-scented. I don’t go in for the perfumy soaps as much, though I do make them and enjoy them. My favorites—the ones I can’t stop smelling myself while they’re out on the curing racks—are the foodie ones. 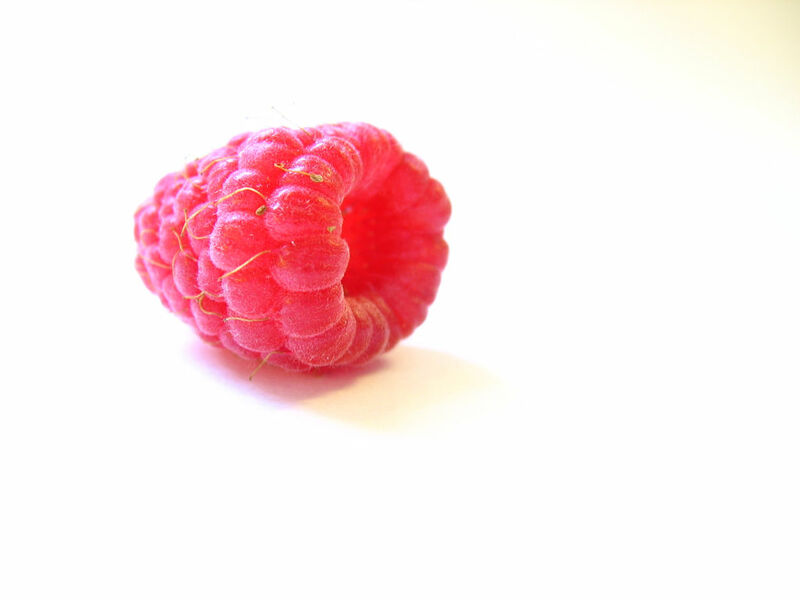 Back when I regularly bought Bath and Body Works, my absolute favorite scent was Sun-Ripened Raspberry. I also love their Warm Vanilla Sugar for winter. In fact, I love most of Bath and Body Works’ foodie scents. I also liked their Velvet Tuberose and Japanese Cherry Blossom, which are floral scents, but for the most part, the kinds of scents I tend to like best are berry scents or vanilla scents. The last issue of Saponifier had a great interview of Jo Lasky by Beth Byrne called “Creating a Scentsational Product Line.” Jo covers a great deal of ground in the interview, including what happens in the olfactory receptor neuron and the brain when we smell an aroma, the difference between fragrance oils and essential oils, the top ten list of best-selling scents for 2012 as voted by readers and her thoughts as to why those scents moved more products, fragrance trends, and advice for soap/candle/bath suppliers looking to put together an appealing scent line. If you are soapmaker, it’s worth the price of the magazine subscription to access this article alone. For the first time since the inception of the annual survey of top ten best-selling fragrances, lavender was not number one in 2012—it was vanilla. Of the scents on this list, my guess is that Berry Flirt is probably the closest to Sun-Ripened Raspberry because it is described as a blend of red berries and blond woods. However, I haven’t smelled it, so I can’t be sure it’s close at all. I am not surprised to see Japanese Cherry Blossom on the list, as it has been a good seller for a few years now. I am surprised that of the rest of the list, the only ones I’m familiar with at all are Sweet Pea and Warm Vanilla Sugar. I am sure Bath and Body Works likes to change up their scent line so that they can stay fresh and competitive, but I have always thought they risk alienating customers when they do away with popular scents, which they seem to do regularly. I have certainly found that aspect of their business model frustrating. On the other hand, who is to say that my notion of what was popular was actually moving off their shelves? They may be discontinuing scents I like, but that others don’t seem to buy. If you are trying to decide which scents to use, it is a good idea to do your own market research. Make products that appeal to you and watch to see how they move. Keep track of which scents are requested. My biggest mover is Lemongrass Sage. I was recently asked if I did a lavender scent, but at the time, I hadn’t used it. I now have two different lavender soaps—Provence and Lavender Spearmint. Take stock of those scents that people request, and watch what moves in bath and body stores like Bath and Body Works, Victoria’s Secret, and Lush, but ultimately, use your own common sense as a guide. I think a great deal of success in soapmaking depends on your own intuition about what kinds of oils to use, what kinds of fragrances, and what kinds of designs will work. I also think you tend to create more loyal customers than big bath and body stores, and they will seek out their favorite products over novelty. I know of some soapmakers who eschew fragrances, but given the popularity of scent in soaps, I would recommend treading very carefully if you choose not to use a fragrance at all. The first thing people do when they see my soaps out on display is pick them up and smell them. I do the same thing when shopping for handmade soap. It definitely makes it tougher to move soap online—obviously customers can’t smell soaps in my Etsy store, but I think there are some smart techniques soapers can use to increase online sales. Celine Blacow’s videos seem to help her move products. I know watching a video about the making of the very soap I bought is a little bit exciting. As soon as I can make my work area presentable, it’s something I’d like to try. I just ordered some Lavender Song and Adam and Eve soap from Celine, and I can’t wait for it to arrive. I so enjoyed both of the “making of” videos, particularly Lavender Song, which I have watched several times now. I also think that sometimes customers don’t know what they want until you make it. Steve Jobs famously said, “[F]or something this complicated, it’s really hard to design products by focus groups. A lot of times, people don’t know what they want until you show it to them.” This is true of soap, too. Customers might not think about a certain fragrance as something they’d like, but if they smell it, they like it, or if your description on your online store or video is good enough, their interest is piqued to try it. Ultimately, I think as a soapmaker, choosing a scent I like is part of the artistry, and though I pay close attention to what my customers like, I tend to make soaps that I know I will like. However, I highly recommend reading Beth Byrne’s article, and think about designing a product line with the most popular scents.